Pick up at 08:30am from your hotel for the a day tour of old Istanbul city. Visit to ST. SOPHIA This ancient basilica, built by Constantine the Great in the 4th century and reconstructed by Justinian in the 6th century, is one of the architectural marvels of all time. Lunh break at the Turkish restaurant. SULTANAHMET IMPERIAL MOSQUE Across from St. Sophia built in the 16th century by the architect Mehmet, is known as the BLUE MOSQUE because of its magnificent interior decoration of blue Iznik tiles. HIPPODROME Ancient Hippodrome, the scene of chariot races, with the three monuments; the Obelisk of Theodosius, the bronze Serpentine Column and the Column of Constantine. Lunch break at 13:00pm after the lunch Murtis Tour will then take you to the Bosphorus Cruise tour. Enjoy the array of sites you can see from the boat including: SPICE BAZAAR (Egyptian Bazaar). BOSPHORUS BY BOAT a traditional excursion by boat along the waterway separating Europe and Asia.l. Overnight in Istanbul. After breakfast visit to TOPKAPI PALACE The great palace of the Ottoman sultans from the 15th to the 19th centuries housing an exquisite collection of cyrstal, silver, and Chinese porcelain, robes worn by the sultans and their families, the famous jewels of the Imperial Treasury, miniatures, the Holy Mantle; enshrining relics of the Prophet Mohammed. After the lunch depart for Istanbul Ataturk Airport for domestic flight to Izmir. Transfer from airport and check in to your hotel in Kusadasi. overnight in Kusadasi. 08:30 Departure from hotel fully guided tour of Ephesus, one of the best preserved ancient sites in the world en - route, visiting the Temple of Artemis, Curetes street, famous Roman baths, Celsus Library, Grand theatre and House of the Virgin Mary. Lunch break around 13:00pm. After the lunch, we will visit a place which continues to perform one of the oldest arts of Turkey; a carpet weaving centre and do a Turkish Village Tour. Sirinces construction style today belongs to Anatolian Greeks. The houses on the slope are all Orginal with their white paints. Sirince Village also has a fantastic reputation for making some of the best wines in Turkey - especially fruit wines. We will visit the vineyards and it is time to learn how to make fruit wine with Turkish wine makers. In the evening you will be tested about your knowledge of making fruit wine. On the way we will visit one of the famous leather production centers of the region, where you will have the opportunity to get a good factory rate. 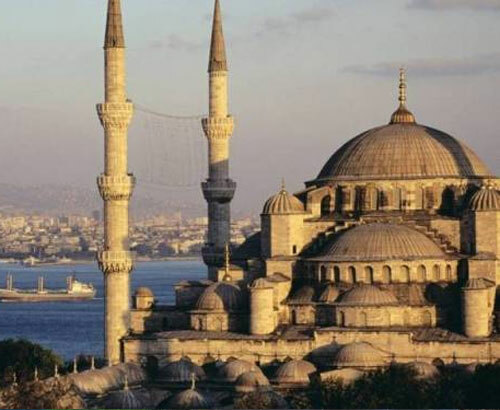 On this guided tour, you will avoid the constant nagging and sometimes bullying that is well known in the markets of Turkey. Enabling you to enjoy the shopping experience whilst gaining the knowledge of the ancient craftsmen Overnight in Kusadasi. At 08:30 we depart for Pamukkale. We will arrive around 12.00 and we have a lunch break until 13.30. Afterwards we shall visit the calcium terraces of Pamukkale (cotton castle) and the ruins of Hierapolis, then walk around this natural phenomenon and have the option of lying in the waters of the natural springs. After Pamukkale tour come back to Kusadasi. Overnight in Kusadasi. Today we depart for Izmir airport for our domestic flight to Istanbul and then back to home. We hope your tour was a memorable one and we would like to see you in the future in one of our tours again. Have a nice trip back home and thanks for choosing Flag. - Services of an English Speaking Chauffeur Guide for groups up to 6 pax. - Professionally qualified English speaking national guide will accompany groups above 7 pax.